We decided to modify the standard poncho or tarp lean-to shelter into something more practical. 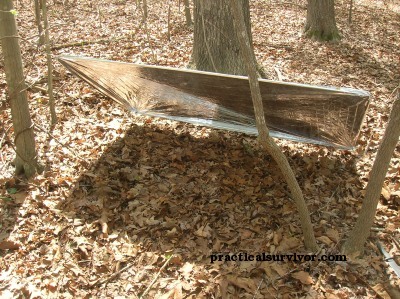 This shelter is a hybrid of several shelter options such as a fox hole, and a tarp lean to. The first step was to choose the proper area to build the shelter. We always want to look above for any dead branches or rocks that could fall on to your shelter. Shelter location can make a difference in temperature, safety and bug percentage. I always make it a point to build above the water line if possible. If I build my shelter below an area with a dam, this could save your life. Water levels can raise with storms and could be dangerous or at least make for a horrible wet night. I know these are basic shelter rules, and I hate to repeat myself, but they could save your life. A lot of your shelter location would be dependent on the environment. If you would like to learn more about other shelters and shelter location, please read our SHELTER article. Once we choose the location, we stretch out the poncho to get an idea of what area we want to clear. There are several reasons to clear up the location. For this instance, we will be digging into the ground, but there are also other reasons. In a desert environment, it would help to lower places for scorpions and other creepy crawlies to hide. In a wooded environment, we usually deal with centipedes and ticks. Sometimes a controlled burned of the ground, can be very helpful. In the images below we quickly stretch the poncho and stake it to the ground using wooden stakes. We climb under the poncho to make sure it is the right height and we will have sufficient room. Keep in mind that we will dig a few feet into the ground. Once the location is properly chosen, we pull the poncho back. In this area, we simply cleared off the leaves to mark the area we are going to dig. We want to make sure the poncho goes beyond the walls of our hole, so water does not drip in. Once we mark the area, we remove the poncho and begin digging. Using your trenching tool, backpacking shovel, or whatever digging tool you have available, dig into the earth a few feet. We pile the dirt around the shelter as a way to stop the rain from running into the shelter (especially if there is a slant to the location) and also can help block wind. In the image below you will see that we put most of the material to the side most likely to have rain run in (top side of the lean). We are planning on building a fire on the lower side, so we leave this area flat. This will allow the radiation from the fire to warm up our shelter and give us light. Again, depending on the environment and the temperature, we will build the poncho shelter differently. If the temperature is going to drop at night, it is a good idea to cover the ground with some form of insulation. 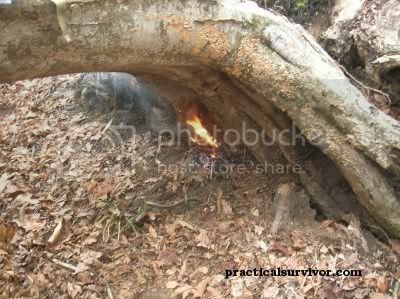 Every survival shelter should be built using your mind and skills based around the situation. If the temperature is very hot, laying down on the colder dirt, would help us to keep our body temperature down. In some desert survival shelters, we would build a removable mat, that we could slide in during the nighttime as the temperature drops, and remove it during the daytime hours. In this instance, it is warm during the day, and the temperature is not going to drop drastically. Now we are able to stretch the poncho or tarp to finish our shelter. 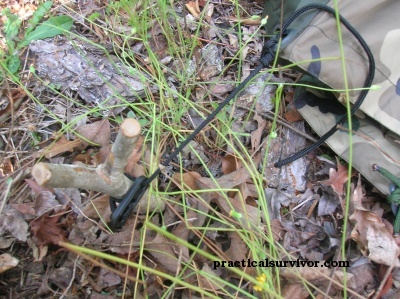 Using stakes to hold the poncho and tying to nearby tree saplings. Stretching the shelter over the parachute cord ridge line (cord spine) tied between two trees and lowering on side, so the rain is less likely to get in. Another option to the walls made of soil, is to dig a trench around the shelter. Nothing would ruin a night's sleep like water running into your shelter in the middle of the night. A crucial step if building the shelter with a poncho versus a tarp shelter , is to tie the head section of the poncho. This area would turn into a water collector. Now that we are going to be dry, we can build a fire. Fire will give us comfort, light, and the ability to cook. While we were cooking, the rain moved in. We added a lot of wood to the fire and waited out until our meal was finished. Using a steam pit , allows you to cook food while you are working on other things. 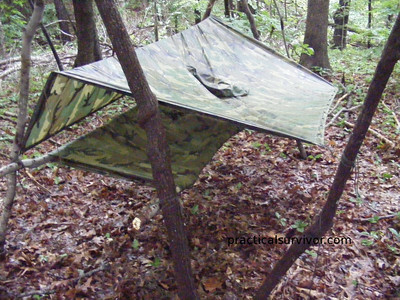 This is just one of the many ways to build a shelter using a tarp or a poncho. Lean to shelters can be built using trash bags, mylar blankets, cloth, sails, rigid material, debris, ponchos and tarps. Although not the warmest shelter in the world, it can be built quickly in an emergency. Voila ! Our dinner is served and we ran into this little guy along the way. I bet he is glad we brought fish along.